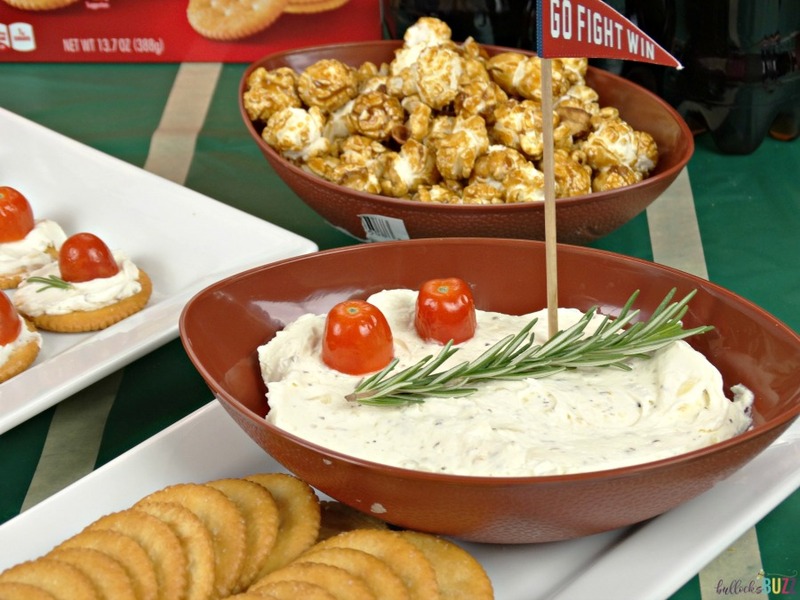 Rosemary, Tomato & Herbed Cream Cheese Bites - Game Day Recipe! Rosemary, Tomato & Herbed Cream Cheese Bites – Game Time Recipe! 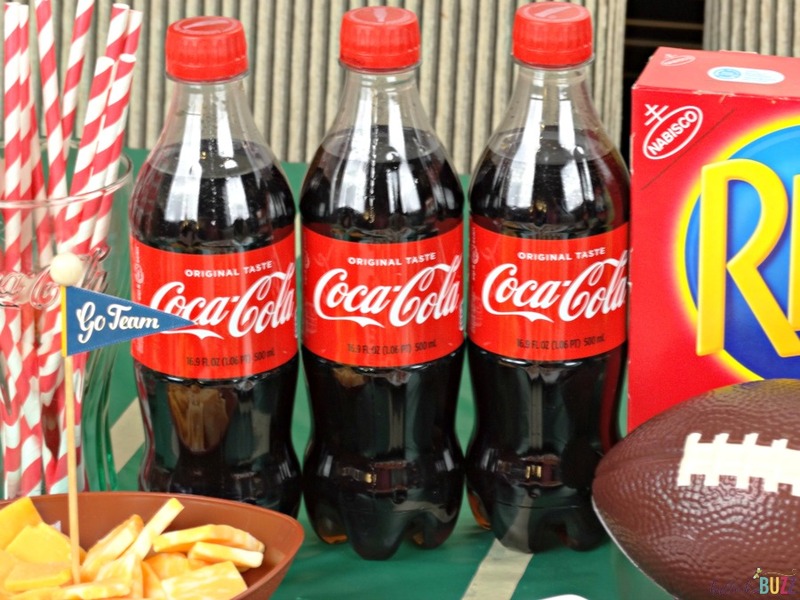 This shopper featuring a game time recipe has been compensated by SheSpeaks, Inc., The Coca-Cola Company and Mondelez International group. All opinions are mine alone. I am always looking for a reason to entertain. And what better excuse to gather friends and family around food than game time?! 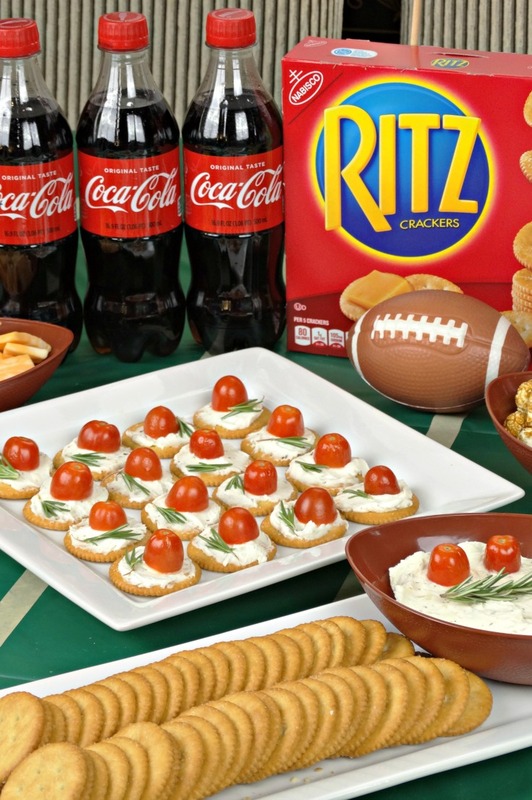 Today I am thrilled to share one of the easiest, tastiest game time recipes with RITZ Crackers and Coke. 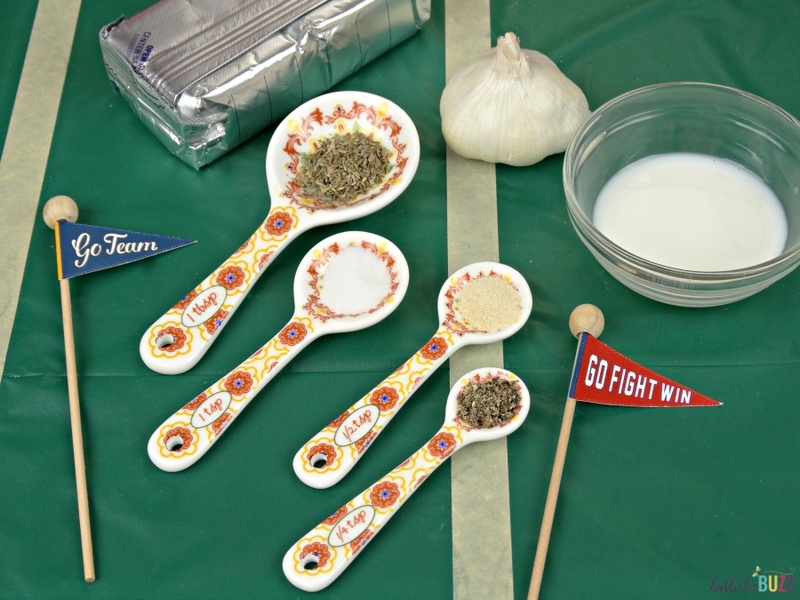 You’ll score a major touchdown with these football party foods, and best of all, you’ll spend hardly any time in the kitchen! Keep reading to find out how to make my favorite game time recipe: Rosemary, Tomato & Herbed Cream Cheese Bites! 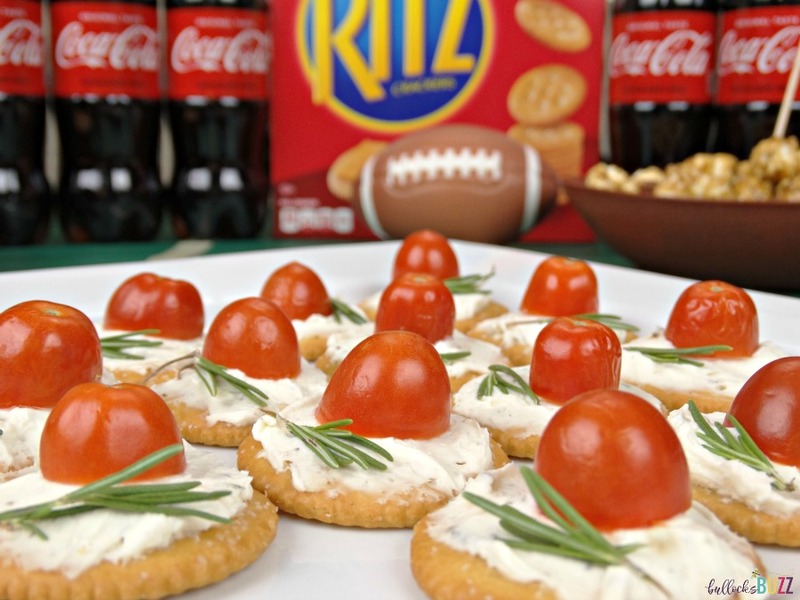 When it comes to planning game time recipes Ritz Crackers are almost always at the top of my list. I love their rich, buttery flavor, and they work so well with a variety of toppings and dips. Plus they’re absolutely perfect when paired with an icy cold, refreshing Coca-Cola! Speaking of toppings and dips, my Rosemary, Tomato and Herbed Cream Cheese Bites are sure to be a big hit! Ritz Crackers are topped with a homemade garlic and herb cream cheese, then crowned with a cherry tomato and sprig of fresh Rosemary. Best of all, this game time recipe requires very little prep work, and takes just minutes to make. After all, no one wants to spend game time in the kitchen! To make these scrumptious Tomato, Rosemary and Herbed Cream Cheese Bites, you’ll need some very basic ingredients: cream cheese, milk, a few common cooking herbs, and of course the Ritz Crackers (full printable recipe at the bottom of this post)! And don’t forget to pick up some Coca-Cola down the soda aisle, too! I found everything I needed at my local Walmart. Once you have all of your ingredients, simply add the cream cheese and milk to a medium bowl. Mix until creamy. Then add in the seasonings, mix well, and refrigerate for about an hour. In the meantime, slice the cherry tomatoes in half. Then rinse and cut a few sprigs of fresh Rosemary. Once the herbed cream cheese is ready, simply spread some on top of a Ritz Cracker, then top with half a cherry tomato and a few pieces of fresh Rosemary. And that’s it – your Tomato, Rosemary and Herbed Cream Cheese Bites are ready to serve! And speaking of serving, make sure to place the remaining cream cheese in a bowl to be used as a dip with the Ritz Crackers! This delicious Tomato, Rosemary and Herbed Cream Cheese Ritz Bites game time recipe will take you less than 10 minutes to make, yet taste like you spent hours in the kitchen! Their wonderfully savory taste with just a hint of spice makes the perfect flavor combination when served with an ice cold Coca-Cola! You’ll score a major touchdown with this simple yet delicious recipe for Rosemary, Tomato & Herbed Cream Cheese Bites. Best of all, you’ll spend hardly any time in the kitchen! Using either an electric mixer or a stand mixer with the paddle attachment, mix the milk and cream cheese together in a medium bowl until creamy. Add the remaining ingredients and mix well, making sure to scrape the sides of bowl constantly. Spoon the herbed cream cheese into an airtight container and place in the refrigerator for one hour. 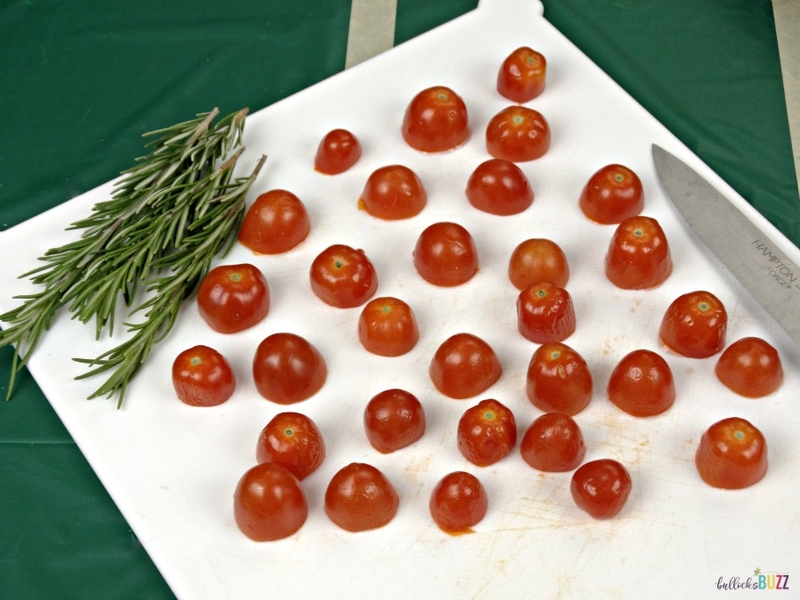 Meanwhile, slice the cherry tomatoes in half, and rinse and cut a few sprigs of the fresh rosemary. Once the herbed cream cheese is ready, simply spread some on top of a Ritz Cracker, then top with half a cherry tomato and a few pieces of fresh Rosemary. The herbed cream cheese also works well as a dip! 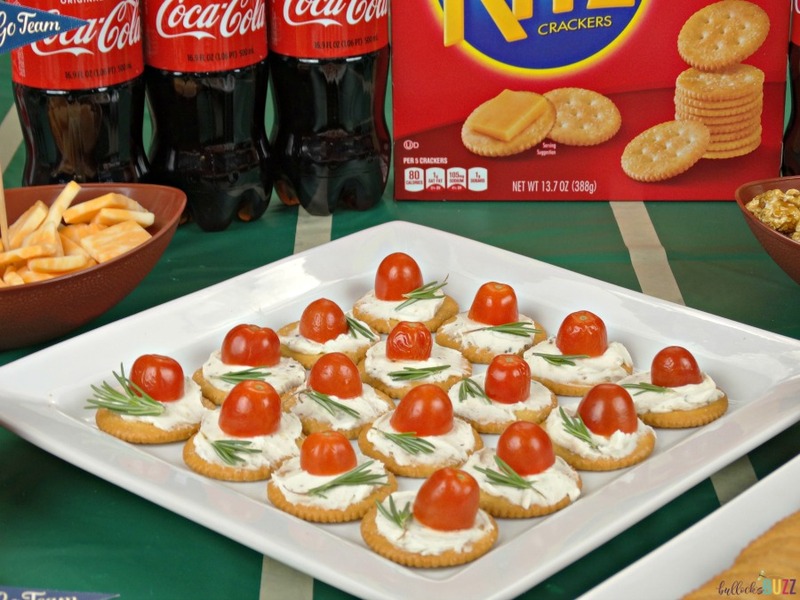 Do you have a tasty game time recipe using Ritz Crackers and/or Coca-Cola? 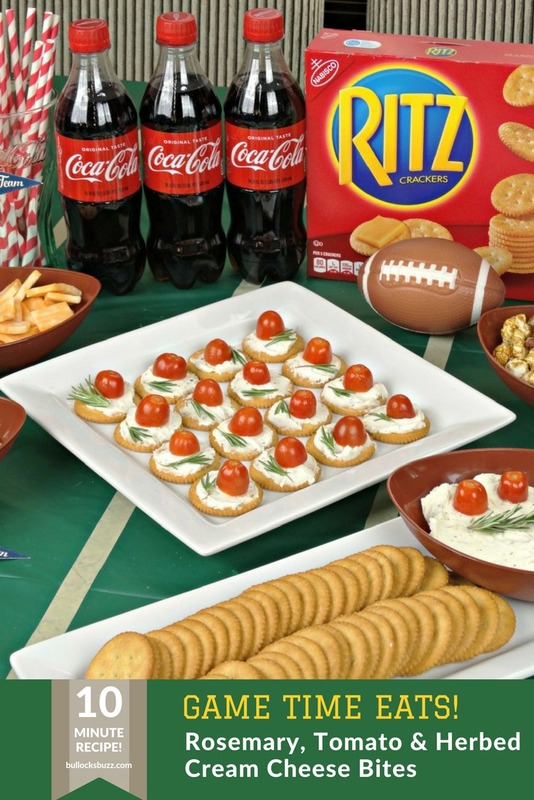 Be sure to enter it in the Recipe Contest on shespeaks.com where you could win a #TogetherForGameTime Party Pack that includes a $40 Walmart Gift Card, two 6-packs of Coca-Cola and two boxes of Original Ritz Crackers! Ooh these looks good! They would be perfect for a gathering with friends! i need to try these! Let me know of you do! They not only taste great, but they are so easy to make, too! Yummy! I make something similar, but I never thought to add Italian seasoning. I’ll have to give your recipe a try soon! I’d love to see your recipe! Let me know if you enjoy this one! I have everything I need to make these at home this evening. I’m going to give them a try. I love rosemary! I have a big plant in my yard so I can always have fresh rosemary. Yes! Rosemary is one of my favorite herbs. I have some in my herb garden as well. Oh my goodness these sound like they would be absolutely delicious, I am a huge fan of cream cheese and these would make for perfect little party nibbles. Let me know if you try it and how it comes out! This is a really great snack idea. Nice and healthy! And it’s so easy to make, too! The part that takes the longest is letting it sit in the fridge for an hour so the flavors combine. All of the other steps take about 5 mins! I love your tomato herbed cream cheese bites! Love the flavors! Cream cheese and tomatoes are perfect together! I completely agree! They are a great flavor combination! This looks and sounds tasty. So love this. Want to try this too, soon! It really does taste great! Let me know if you do try it, and what you think! These treats look delicious. Ive always loved Ritz crackers. They go great with just about everything. Hi Fatima! Yes girl! Ritz crackers really do go great with so many things! I’ve also found lots of delicious recipes online, and cannot wait to try them; everything from sweet to savory! You’re welcome! I’d love to know how it turns out for you!